What is an Artisan? At times one believes that all products marketed in the world should be free, mechanized to reduce cost and incorporated in the market in a grand scale. The artisan, on the other hand, should give the same deal, without a thought given to the fact the product is made by hand, done with all that is humanly possible with what is given. It isn’t the programming of a computer that can produce huge volumes and in turn can “play” with prices. It is realizing the artisan requires a period of time to learn and work effectively. The pace of creating the work and the resulting qualities will differ. All are not equal. The artisans’ abilities and contributions evolve over a periods of time. Their techniques are passed from generation to generation. Symbolic meaning identifies their original domiciles. There are those of the mentality that to be an artisan is to be “behind the times” because their work reflects history, a silent voice that speaks of beginnings. In reality they are the ambassadors of the world’s cultural exchange. They also utilize products from their respective villages. They use natural fibers from plants and animals, fibers that are biodegradable and safe for the environment. There is no comparison with the true artisan and one who merely manufactures. Manufacturing removes the human touch. My childhood was a beautiful stage of my life. Our home had 7 children, 5 females and 2 males. My father and mother gave me those memories and comfort. As sudden as joy, came sorrow. I became an orphan at the age of 9. My oldest brother at 12 quit school to work to support the family. 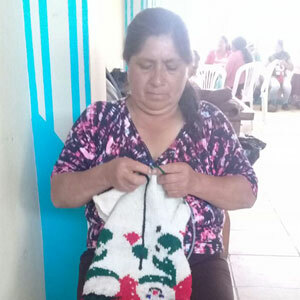 The girls continued with the skills passed on by our mother: knitting, embroidering, straw hats made from what the earth gave, quilting with lamb’s wool. We wanted to finish our education, but the lack of money prevented it. My brothers went to the US to work. I learned to embroider, knit and do other crafts at the age of 9. I was so happy when my oldest sister got a job assisting in the school. 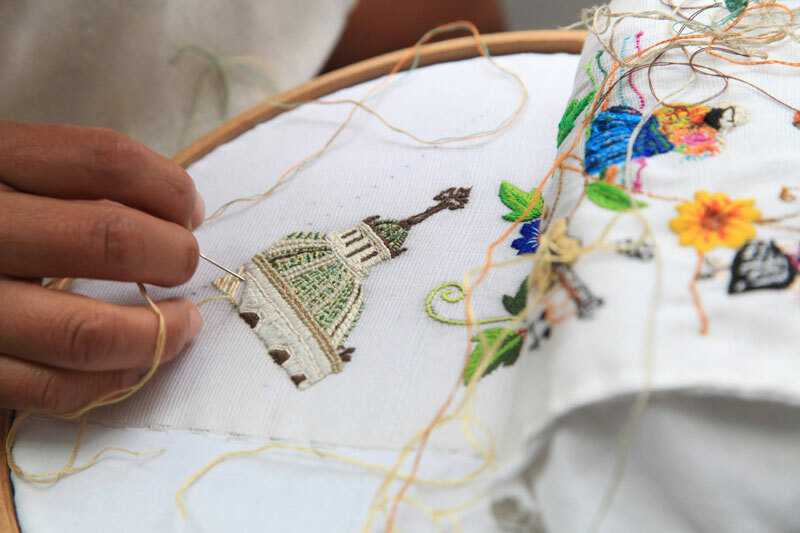 I accompanied her, but my vision was to embroider. I knew I needed a very good teacher to improve my skills. At 13 I was part of the Centro de Bordados. I wanted to work there as I knew they had the best quality. Being there and proving myself led to their design department. At 18, I entered secondary school and completed my bachelor’s degree at 22. I met a boy from my parish. This love gave us Doris. My spouse, however, soon left for the US and forgot us. I had periods of deep sadness, but I had Doris, my child. I soon met another man and had a child. This, too, was a mistake. He did help me financially however. I now have my own house and I have made it a home. I had a terrible scare with a car accident. The cooperative brought me an embroidered costume during my recovery that changed my life. Their love and thoughtfulness was inexplicable. In the Cooperative, I have had joy and sadness. I’ve met associates in many villages while travelling and represented the Cooperative. I’ve been to places I never believed possible. What I heard from these people of different countries, cultures, backgrounds is that none have seen work as fine as that which we do. The Cooperative has held my life together. There is such joy and satisfaction in my work and being part of this incredible organization. At 26, I began to embroider in the Cooperative. 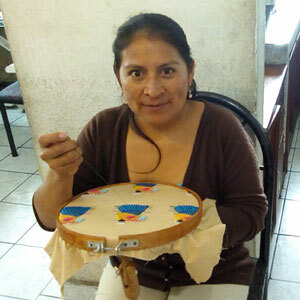 Before that I worked in the village of Gualaceo doing many different types of craft work with thread and cloth. It was quick work as the designs were simple, never complex. This though is how I learned to sew, knit and embroider. Later, I married and had my daughter. My affiliate told me about Centro de Bordados. It was a place organized for women of the countryside to embroider, knit or sew. I didn’t want to go to the city and abandon my children and husband. I knew I needed training and went with a troubled heart. The women at the Cooperative are exemplary. I’m grateful to God and to them for all I learned. I carried on as best as I could with my 3 children to achieve my goals. I continue working but have problems with my vision. I taught my sisters, friends and daughter these skills. None cared to continue in my footsteps, however my daughter does do handicrafts. I, personally have loved this from the time the nuns taught me . I even made my own needles from wood. The work is clean and can be done at home. I can see my children, cook, watch the animals. If it rains, I can work with my hands inside creating beautiful images. This artistic work helped me economically. I began with nothing. Now my husband and I share 2 properties. I’ve now been with them for 22 years. I love the interaction; the laughter, the crying, the stories, the LOVE. I work 5 hours a day knitting. I will re-adjust my glasses as I intend on doing this until I’m 90!